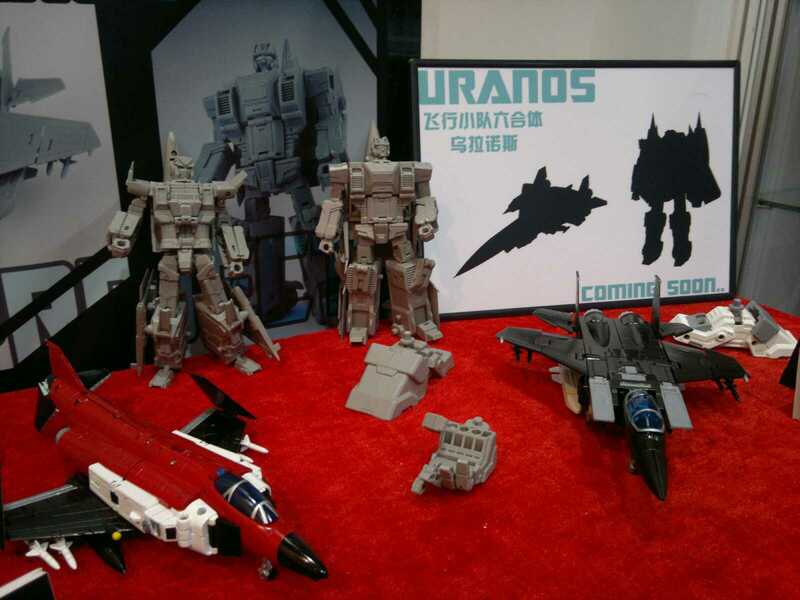 Well, before I get done with my Hot Spot post I thought I’d throw this up – apparently TFC confirmed that there will be 6 figures composing the Uranus (Not-Superion) set. First camp – GEEEWON! 6 Bots BOOOOO EVIL TFC! Second camp – Okay, sure. That means more expense, but if he’s anything like Hercules (not-Devastator), then that works for me! Here’s my take – obviously I’m in the second camp seems I unbiasedly made the first camp sound like screaming babies. They’re not, I can understand the outrage, Superion, like most of the other post-Devastator combiners has traditionally been 5 members. My take is, okay, traditionally he’s been 5 but there HAVE been 6 members before, just not in the cartoon (which is what a lot of the fans base their reactions on.) Just recently in IDW’s Robots In Disguise, the sixth member of the Arielbots was tragically killed in an explosion. But there were six, possibly more. Frankly, if the end result is a good looking, big as Devastator (Hercules) Superion, I don’t care if they make it 6. Arguing that they’ll be more expensive might not be an accurate stance – if they stuck with 5 members, Silverbolt would end up bigger, and likely cost more than the limbs anyway. So, what do you think? Am I totally wrong? Tell me why – I’m more than happy to hear peoples opinions on this one way or the other. My two cents: looks like TFC is setting up Uranus to be the opposite of Hercules? I always saw Menasor as the arch-enemy of Superion. Devastator was more a foil for the Dinobots in my mind. Anyway, that’s how I play it out in my man cave. And five robots for a (not) Menasor would be ideal, as (not) Motormaster would be bigger than the other four. I feel that I should mention, though, that I am more of a Geewuner. I still haven’t found the nerve to shell out the money for Hercules, but it is a beautiful figure. From what I’ve seen, the first two figures making up this new combiner look great as well. But if the sixth figure’s alt-mode is an A-10 Thunderbolt, TFC will undoubtedly have my money. And thanks for the post. I enjoy your blog. Hey thanks J, I appreciate your feedback and opinion on this. I agree, in the cartoon at least, the Dinobots were typically dispatched to deal with Devy. I think TFC is probably so used to the Herc project that they had a six member mindset. Im going to sit and watch as the info trickles out. I’m 90% in for Not-superion but we’ll see. I’m 100% in for Fansproject take on the Stunticons though! I thought TFC was very faithful to G1 with Hercules, hence his great appeal, so I too am going to wait and see how this plays out. I am betting they are attempting to keep all the individual members the same size (like they were portrayed in the cartoon) but this sixth member may be a partsformer of sorts (like RID Ultra Magnus) that would increase the size of Silverbolt in the combined mode making him still effectively a five-member combiner. I can’t believe they would deviate so far from what made Hercules so popular but I could be wrong. Either way, a six member Aerialbot team just screams IDW at me so I’m game no matter what they do. Me too Ark. That seems to be the most common speculation, that the sixth member will be some kind of attachment member. But yeah, either way, I’m in for now. I’ll wait to see what news comes out, though I am tempted to pre-order the first two members. Eh, 5 or 6 figures it’ll be more money than I want to spend so I’m out regardless of what they do. Besides, I’d rather save for FansProject’s not-Menasor. I agree, its going to be another 600USD set, which is unfortunate. I don’t regret Devastator one cent, but ANOTHER 600 is going to be pushing it. TFC’s going to make me get a part-time job to afford their stuff! Not-Menasor is my current TOP PRIORITY though. TOP…PRIORITY. Yeah, I believe that’s been confirmed now, so it’s still really just 5, with a 6th little add on guy that comes with Silverbolt. Like Roller with Optimus Prime, that’s how I see it. I’m getting excited, these guys are going to look amazing! I’d bet my last dollar on that, you bet! Now we know how the set will be comprised I’m starting to lean back in a bit. I at least will get “Fireflight” if nothing else. The packaging for Fireflight looks outstanding. I’m kind of “all in” but I’m going to try and sell some stuff off to build up a fund for it. I don’t want to just drop 600 bucks on him immediately.